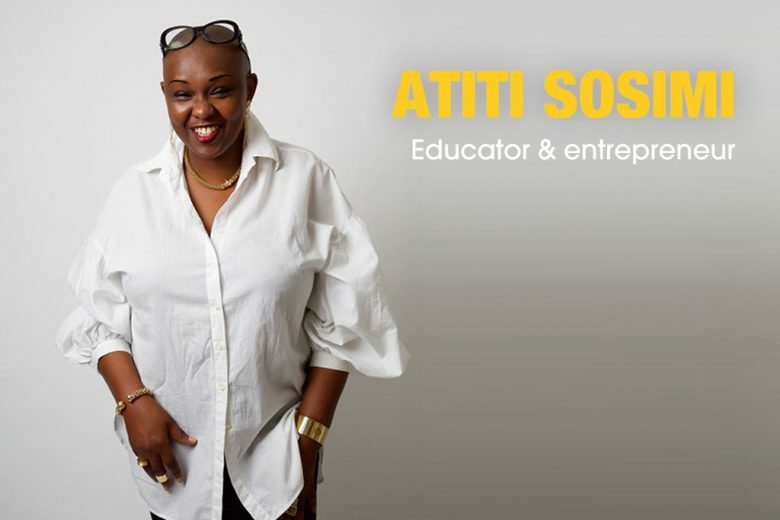 Atiti Sosimi is a mother of six, multi award-winning educator, volunteer and entrepreneur. She tells us what drives her, and more importantly, how she manages to do it all! I am a social scientist and an educator. I have a BSc Sociology & Anthropology, a PgCE in Learning and Teaching, I have completed the PgD in learning and teaching for higher education focusing on applying learning technologies completed my MALTHE dissertation in 2014. As you can tell I love to learn, it enriches and empowers me and also serves as a good example to my children. When they see me studying and enjoying the process it encourages them to seek joy from their own educational journeys. After I completed my studies (and actually while I studied) I have always had some form of enterprise. Being in business has always excited me and has proven to be another great way to continually learn and grow. I also started volunteering then working in the voluntary community sector, the Citizens Advice Bureau and other advice agencies which gave me an insight into the importance of social enterprise – so even while volunteering I was able to learn. As the Late, Great Maya Angelou once said: “When you learn, teach, when you get, give.” When I learnt I decided to teach and so have been a part-time higher education lecturer and educational consultant during my career journey. I started my business journey in 2000. Life dictated the direction in which I took, I just followed my heart by faith. I needed to survive mentally, emotionally and financially and so business seemed to be the best way to reclaim my personal power. I was bought up to see any challenge, trial or circumstance of adversity as an opportunity to do something different, be different and use the breadth of my skills, knowledge, abilities, experience, talents and passion. I have experienced many situations in which challenges have tested me but I drew strength from the lessons of my upbringing, my children and my inner coach. Being in business gave me the independence and strength that I needed in order to thrive and rise and oh, how I have risen! I’m designer and brand owner of Eyato LONDON, the high end couture handmade in London label for women. I love working with the fabrics and designs that make my clients feel elegant and beautiful. I’m a Tea Party Hostess. I run a networking event called Tea with Atiti which has become very popular for women in business and professionals. I’m Founder/CEO of The Big Secret Company, a social enterprise focusing on learning and practising decision making skills through gameplay. I’m also a trained music manager, published author, inspirational speaker, business and personal mentor, board game inventor, animation creator and a creative entrepreneur. That’s a difficult question to answer, really difficult. I see things very differently from many people. I see success as an ever-evolving state of mind, and perhaps an ability to keep going even when things do not look ideal. Although I wouldn’t necessarily say that I can pinpoint my biggest success, I am proud of everything I have accomplished because I know what I have to put into each day. Which is why it is nice to have these accomplishments recognised by my peers! In 2012 I was awarded the Mentor of the Year award at the East Sussex Women in Business Awards. In 2013 I was named Educator of The Year by Women of Africa, and more recently I was awarded an Excellence in Education Award by NUBAA. Aside from being wonderful gifts, these awards are physical symbols of appreciation from those who recognise some of my accomplishments. Winning awards is not enough though because I still have so much to do, so perhaps my biggest success could be NOT giving up! In the same way that NOT giving up has given me the tenacity to keep striving for excellence, it also means that there are times when I do not know when to stop, which perhaps is a challenge. That is not because I cannot keep going, but we all need to take a moment for self-care. This is something I have learnt and am still learning and encourage all women to take the time to put themselves first. I am celebrating and appreciating myself more and more each day but remember even this challenge is another reason to win. It comes full circle – even when I am faced with a challenge there is an opportunity to succeed. My father, my family and everyday people who I know struggle through life, but live in hope that their tomorrow will be better. If they don’t give up, how can and why should I? These everyday people are all around us, but sometimes we are so caught up in ourselves we don’t notice them. They’re our neighbours, people in the shops or on the buses we frequent, the cashiers who work in the banks we use, the teachers who teach our children wards, nephews and nieces or the receptionists at the hospitals, dental surgeries and hotels we attend. People who work next to and opposite us; they inspire me and I pray I can inspire them! How do you balance your work around your family? Family always has to come first. This means that all my other projects have to be placed on hold if my family needs me. I have a range of strategies to ensure my family home is a peaceful one, filled with happiness and love. My family life ‘strategies’ ensure that I can incorporate delegation, teamwork, quality time and play (I love to play) with my children. It might sound very organised, almost regimented but it is necessary. I have raised (and am still raising some) six children, so order if very important but even more importantly so is fun! This is part of my inspiration behind inventing the Shhh or Tell It board game, The process with its rules and scores maintain a sense of order but ultimately it is about learning and having fun. The one bad habit I have during the course of working and raising my family is that after breakfast, when I’m on a roll, I often forget to have lunch! I generally remember food when all the family are around. I always associate food with family now so that’s not such a bad thing! I have a creative mind and so it would be difficult to write out exactly how I structure my day but it consists of breakfast, power naps and exercise to keep my energy levels up while I work. Enjoy whatever you are doing in life, and if you feel the cart is running away with the horse don’t be afraid to ask for help. If you seek help and guidance through a mentor or even a friend it can lighten the load and revitalise you, even when you’re feeling low. Don’t do anything when you’re tired. I can’t emphasise this point enough. We often over-exert ourselves, particularly women, but we have to rest and take care of ourselves. This is something I have learnt. My children all help around the house and do their own chores which helps. I have encouraged my children to take part in keeping our family home running like a well-oiled machine and it works so that I can take my power naps and be the best mum I can be for them. Make failure work for you and use the time to reflect, appraise, revaluate, regroup and return with joy. It’s your thing, so make it work, you can! I have used these tips to give me the vision to work on continuous growth and expansion in my business, refining, developing and improving my products. Most importantly I have used these tips to keep being happy, healthy and thankful for each day of my life, and the opportunity it presents for me to positively impact the lives of others. I hope the aspiring business mums who read this will be just as happy and positive about their futures. You can connect with Atiti on Twitter.